The False Bay Gun Club is his haunt, and as Western Cape Chairman of the Professional Firearms Training Council (PFTC), Keith is your best option for intensive and thorough training. He is also a Firearms Training Councillor – a teacher to the teachers. Come for Shooting Training at our shooting training academy. In most European countries you cannot just shoot. 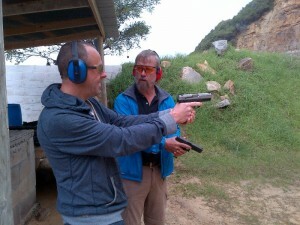 Assault firearms and handguns are even difficult to arrange for shooting training. Typically, it’s only clay target (pigeon) shooting! So, come for a full shooting experience with assault weapons and handguns, in a safe and controlled environment. Packages include instruction, club entry, use of safety equipment, use of firearms and ammo (under supervision, of course! ), followed by shooting for pure fun and then for a score. What better way to spend an afternoon! Contact us for more information on our packages and prices.